Practice Object Oriented Programming questions and answers for interviews, campus placements, online tests, aptitude tests, quizzes and competitive exams. This set of Object Oriented Programming (OOPs) Multiple Choice Questions & Answers (MCQs) focuses on “Upcasting”. Explanation: The upcasting concept includes only the casting of subtypes to the super types. This casting is generally done implicitly. Smaller size types can fit into larger size types implicitly. 2. Which among the following is true for upcasting in inheritance? Explanation: The upcasting concept in inheritance is always applied upward the inheritance tree. The derived class objects can be type casted to any of its parent class type. Since is a relationship applies in general inheritance. 3. Which among the following is safe? Explanation: The upcasting is always safe since the derived type or the smaller type is converted into the base type or the larger size. This results in allocating a smaller size data into bigger type data. No data is lost in casting, hence safe. 4. Which among the following is best situation to use upcasting? Explanation: When a general code has to be written where we use only the supertype object or the data of bigger size, then upcasting would be the best option. Since the whole code will require only the supertype name references. 5. Which property is shown most when upcasting is used? Explanation: The code written using upcasting mostly shows complex code in simpler syntax feature. This is because the upcasting concept can be applied as polymorphism and to group the similar type of objects. 6. Upcasting and downcasting objects is same as casting primitive types. Explanation: It is a bit confusing concept since both casting concepts are different. Primitive casting depends on the type and size of data being typecast. Whereas in objects casting, the classes and inheritance order plays a big role. 7. Which casting among the following is allowed for the code given below? Explanation: The casting 2 is correct. The objects casting must be done from derived class object to a parent class object. That is, the object of the superclass can be made an object of subclass only. Vice versa is not possible. 8. If multiple inheritance is implemented, which upcasting will be correct? Explanation: The upcasting of derived class object is possible to any base class. This is because the base class object can represent any of its derived classes using upcasting. Explanation: Both class A and B are parent classes of class C. Class C object hence can be upcasted to any of those class objects. It is not compulsory to upcast to nearest parent. 10. Upcasting is _____________________ without an explicit type cast. Explanation: The public inheritance shows the most flexible is-a relationship. Hence explicit type casting is not required. Implicit type casting is done by the compiler. 11. Which concept is needed because of implicit type casting use? Explanation: Since the implicit type casting allows casting of a base class pointer to refer to its derived class object or even base class object. We need dynamic type casting so that the references can be resolved during execution of program. 12. When are the pointer types known for upcasting the objects? Explanation: The pointer or reference types are known at compile time for the upcasting of an object. This is because the addresses must be known for casting the derived class to base class object. 13. When are the object type known for upcasting the objects? Explanation: The upcasting with objects directly requires runtime resolving. The objects are fixed and address are allocated at compile time. But the execution of a program requires runtime knowledge of object types, for implicit type cast. 14. If two classes are defined “Parent” and “Child” then which is the correct type upcast syntax in C++? Explanation: The syntax must contain the base class name first. So that the parent class object pointer can be declared. Then the object is assigned with the derived class object with & symbol. & symbol is added to get the address of derived class object. 15. Which among the following is true? Explanation: The type of inheritance doesn’t matter with the upcasting concept. Upcasting applies to all types of inheritance. Any derived class object can be upcasted to any of its base class object. 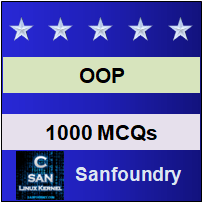 Sanfoundry Global Education & Learning Series – Object Oriented Programming (OOPs). To practice all areas of Object Oriented Programming (OOPs), here is complete set of 1000+ Multiple Choice Questions and Answers.